Hallmark Card Rewards: Earn Rewards when you purchase Hallmark Cards! When I was growing up, even though we lived in the same city, my grandparents would always send a Hallmark card for birthdays and holidays like Valentine’s Day, Easter, and Halloween. There was usually a special note written inside and some extra cash to buy something fun. I kept several of those cards and now, even though they have passed away, I cherish the opportunity to go back and read them. My mom has continued this tradition with my children and I love to watch their faces light up when they see that they have received a card from Grandma in the mail! Now that I have a family of my own, I’ve seen the power of finding the “right” Hallmark card. A card left for a child can turn a bad day around. It works with spouses, too! In those moments where you can’t quite think of the right thing to say, Hallmarks always comes to the rescue for you! I have so many fond memories of Hallmark cards that I was happy to partner with them to tell you about their new Hallmark Card Rewards Program! Not only does Hallmark help you make the most of all those special occasions and everyday moments, but now they are REWARDING you, too! Buy Hallmark cards at more than 30,000 grocery, drug stores, and super centers across the U.S.
Download the Hallmark Card Rewards mobile app (available for Android and iPhone), register for an account, and scan the barcode on the back of your cards. 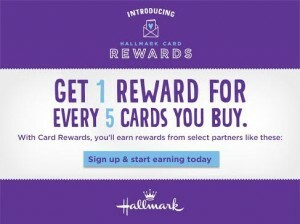 You’ll earn 1 Reward of choice for every 5 Hallmark cards you purchase! Rewards include gift cards, discounts, dollars off, and more. Use them to enjoy together time or “me” time! As an ADDED BONUS, if you are one of the first 1,000 people to register today, you will be entered to win $500 in CASH! That would be a nice bonus this time of year! I LOVE that Hallmark has cards for every occasion and every budget and I love them every more now that they’re offering rewards for purchasing them! I purchased a few cards and scanned them using the app on my iPhone. It was super easy and I’m on my way to earning my first reward! After you sign up, comment and let me know what rewards you’re hoping to earn!